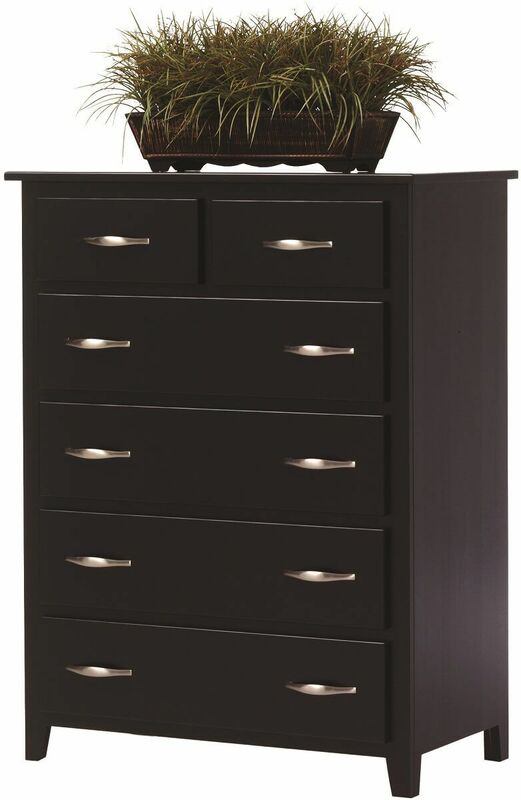 Our Brentwood Chest of Drawers boasts our specialty Vintage Black painted finish, satin nickel hardware, and clean lines throughout for a Modern look. Mortise and tenon joinery, known for its durability, is used by our Amish artisans to assemble the Brentwood Chest of Drawers. Additionally, each drawer of the painted chest of drawers is dovetailed to ensure its durability and longevity through daily use. Only the finest solid hardwoods are used, ensuring integrity and strength. Using the options menu, indicate your custom specifications for the Brentwood Chest of Drawers. If you are hesitant about your wood finish or stain decision, request samples to view in the comfort of your own home. Our Amish artisans craft each Brentwood bedroom piece to order.